The extent to which someone develops their passion and calling for is affected by when they are exposed to it, if it all. It wasn't until 2009 (the summer before my junior year) that I was first exposed to microfluidics when Dr. John T McDevitt came to Rice University. I wish I had met him earlier, because I was hooked from then on, and knew that I wanted to enter the field. Although I had been somewhat familiar with nanotechnology and MEMS since high school, I had never heard anything about microfluidics. I can only imagine what would have happened if I had started learning about the field when I was in high school. With the increasing presence of the microfluidics, it only makes sense to have people learn about it before they're working on it for their Master's or PhD, or seeing it in the news. That's the goal of Dr. Michelle Khine et al. of University of California Irvine. In case you're not familiar with Dr. Khine, you may remember her as one of the 2009 TR35 recipients. It's an award by MIT's Technology Review that recognizes young innovators under 35. 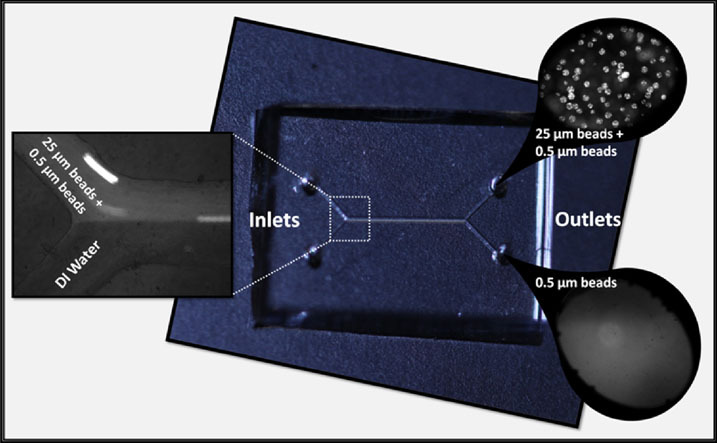 In the paper "Shrink-film microfluidic education modules: Complete devices within minutes," which was published in Biomicrofluidics in June 2011, they outline a plan to introduce the field to middle schools, high schools and undergraduate programs. When compared to standard techniques, microfluidic systems can boast faster reaction times, portability and lower sample usage. Despite these advantages, they are still traditionally expensive to produce, which has limited their accessibility outside high-tech companies and universities. The authors of the paper note that thermoplastics (among other materials) are a low cost alternative fabrication technique that can also be used for education. Thermoplastics are essentially Shrinky Dinks you might have played with as a kid. You can draw on them, and they'll shrink when heated. The authors developed experiments using this material for middle school, high school and college classes, in which each level draws from and expands on the one before it. Using computer-aided design (CAD), the students are able to design their devices, and print them onto the plastic using a printer. After heating the plastic to shrink it to 95% its original size, it's used as a mold to create the device. The basic module for the middle school students is comprised of an H-filter. An H-filter is a simple microfluidic structure that is able to sort particles by their size without a membrane. The students replicate the filtration of blood using different sized microbeads. The results of the filtration can readily be seen. In addition to the previous module, high school students can build a microfluidic device that creates a gradient. A lot of biological processes are driven by gradients, making it a key environment to reproduce. The gradient generator design features branching and mixing channels that take inputs of plain water and dyed water to produce a gradient of concentrations at the end. In order to add a level of complexity for the gradient generator in a college classroom, it has been combined with an immunoassay. The channels of the structure are first coated with a primary antibody. A secondary fluorescent antibody is then fed through one inlet, as a serum is fed through the other. The resulting fluorescence indicates the same gradient occurs as was seen with the food dye previously. I think that this paper not only illustrates something cool to teach students, but takes it two steps further. It first illustrates some of the interesting characteristics of microfluidics such as diffusion mixing and laminar flow. It then illustrates possible applications of the technology in diagnostics or point-of-care devices. As microfluidics education grows, I think we'll eventually see grad students who started learning the same year as their mentors!